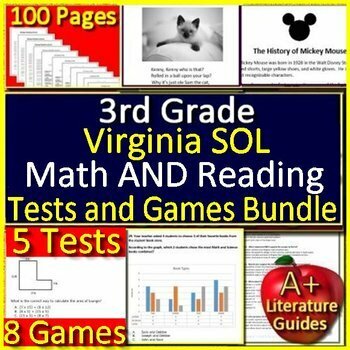 This is our BIGGEST BUNDLE YET for 3rd Grade Virginia SOL! 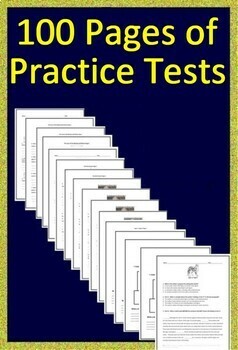 Improve reading and math scores through this practice tests and games bundle! There are 9 reading passages with 90 questions and answers, 2 math tests with 90 problems and answers, and 9 reading and math games with 225 questions and answers. The games are teacher-led Jeopardy style game shows for PowerPoint. The practice tests can be taken on paper, or in Google Classroom via Google Docs. 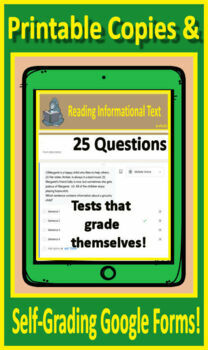 The reading questions include multiple choice, multiple select, hot text, two part hot text, TEI and graphic response. The tests cover the Virginia informational and literary standards, as well as the math standards, for grade 3. All answer keys are included.